PETER CARTWRIGHT. 1846 political opponent of Lincoln. Rare holograph marriage document signed. Sangamon County, Ill., May 9, 1825, about 8x3. Certification of celebration of rites of matrimony according to Methodist Episcopal Church. Fine, does have a repaired tear going horizontally through some of the letters and the C in his signature.. 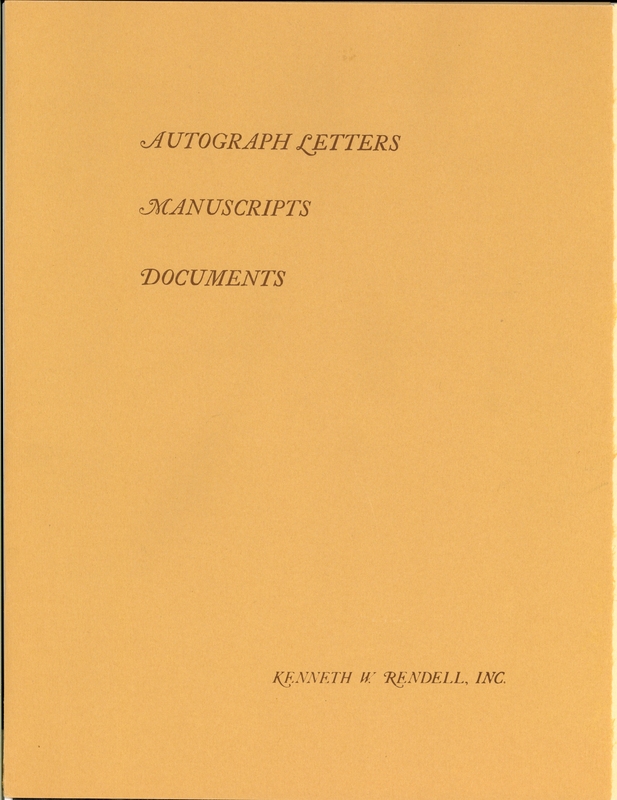 In original autograph dealer Kenneth Rendell Folder. There is interesting story about Lincoln and Cartwright found in Carl Sandburg.. volume 1 pp 147-150 referring to one of their encounters. PETER CARTWRIGHT. Famous and rugged old-fashioned circuit rider, a storming evangelist, exhorter and Jackson Democrat. ... He had lived near New Salem, held camp meetings there, and Lincoln had heard him and of his ways .... He (L.) went to a religious meeting where Cartwright in due time said, "All who desire to give their hearts to God, and go to heaven, will stand." .A sprinkling of men, women and children stood up. The preacher exhorted, "All who do not wish to.go to hell will stand. All stood up - except Lincoln. Then Cartwright in his gravest voice: "I observe that many responded to the first invitation to give their hearts to God and go to heaven. And I further observe that all of you save one indicated that you did not desire to go to hell. The sole exception is Mr. Lincoln, who did not respond to either invitation. May I inquire of you, Mr. Lincoln, where are you going?" Lincoln slowly rose: "I came here as a respectful listener. I did not know that I was to be singled out by Brother Cartwright. I believe in treating religious matters with due solemnity. I admit that the questions propounded by Brother Cartwright are of great importance. I did not feel called upon to answer as the rest did. Brother Cartwright asks me directly where I am going. I desire to reply with equal directness; I am going to Congress."